The earliest know Edwards ancestor is Griffith Edwards. He was born circa 1801 in Llangeitho, Cardiganshire. He married Jane and they had nine children. 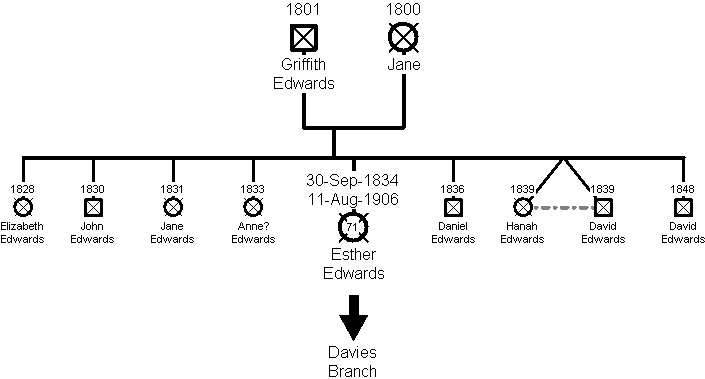 The fifth child, Esther Edwards, was born on 30 September 1834. The family lived in a farm called Llettyr-Panwr in Gartheli, Cardiganshire. Jane died between 1851 and 1861. Griffith then married Mary. Griffith died after 1871. Esther Edwards was born on 30 September 1834 in Gartheli, Cardiganshire. On the night of the 1851 census she was working as a general servant. On 13 April 1860 she married Evan Davies, the son of Evan and Griffith Davies, at the Chapel Gartheli in the parish of Llanddewi Brefi, Cardiganshire. After marrying they went to live at a farm called Pantyfod in the village of Llanddewi Brefi. Esther died on 11 August 1906 and Evan died on 3 January 1901. Evan and Esther had 11 children and obviously used a pattern when naming the children – named after grandparents, parents, and then uncles alternating between his and her families. This naming convention meant that their fourth child was also called Evan Davies. He was born on 24 June 1865 at Pantyfod.